Getting good Wi-Fi has always been a pain point, especially for those with larger homes or multiple floors. So, when Eero brought its first whole-home Wi-Fi system to market in 2016, it was a big hit. In fact, its initial mesh Wi-Fi system helped create a new sub-category of Wi-Fi routers, Wi-Fi mesh routers. And now, its newest version aims to catapult it to the top of the category again. To regain its position as the market leader required plugging some holes the previous model had revealed, namely in range and throughput. Eero also opted to veer in a slightly different direction with its hardware. Rather than use identical nodes, the main router comes with two unique satellites called Beacons. These plug directly into wall outlets for a wire-free setup designed to be less obtrusive and simple to install. 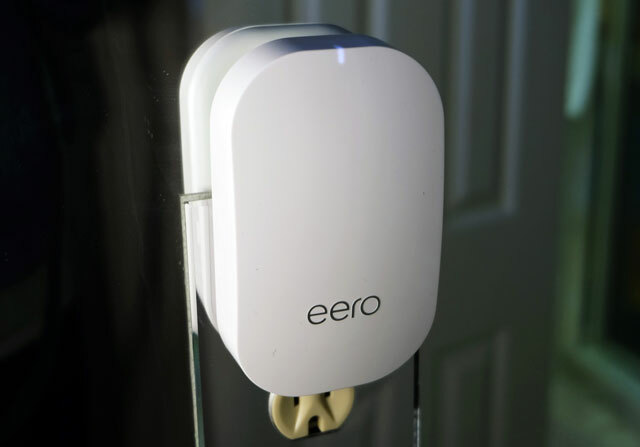 It’s an admirable move, considering simplicity is a hallmark of Eero’s mesh network. From setup to maintenance, the process is supposed to be so easy your parents could do it. Download the app, follow the steps to plug everything in, and your new Wi-Fi mesh network should be up and running in minutes. 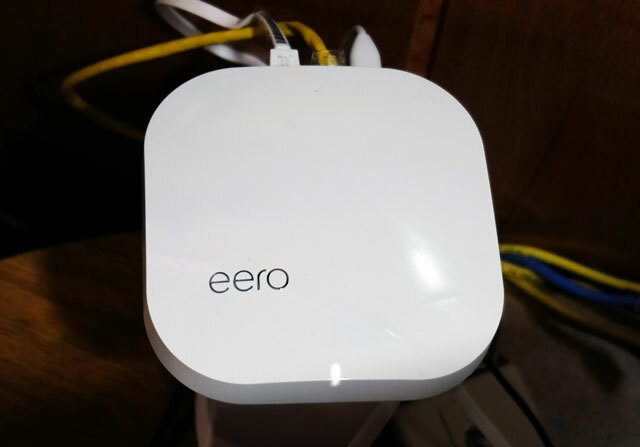 Once the bandwidth flows, is this next-gen Eero good enough to stand out as a leader? We spent weeks testing to find out. 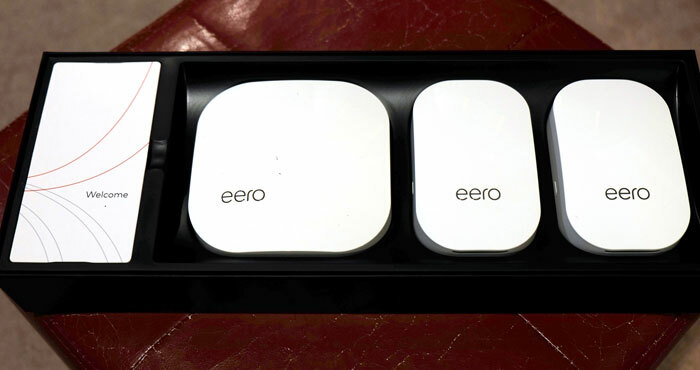 The Eero comes in three different packages. The one reviewed here is the $349 three-pack that includes the main unit and two Beacons. The $249 Eero Home comes with the main unit and one Beacon. The $466 Eero Pro has three main units for larger homes that really need to spread out the mesh. Little has changed in the operational premise from the previous Eero to this one. The iOS and Android app is the effective instruction manual, offering step-by-step instructions to first plug things in correctly. It then goes to work automatically recognizing the primary router and initiate the process for walking through the home network’s configuration. The basics are essentially the same too. 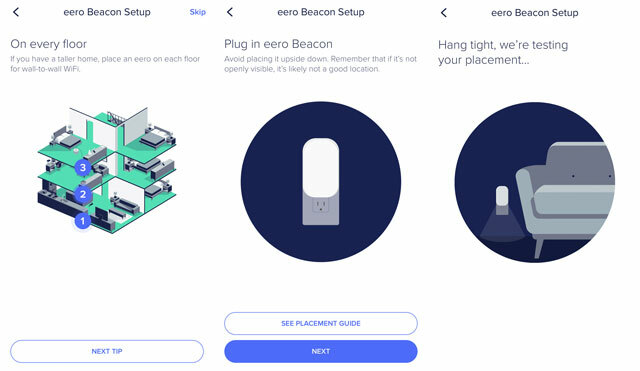 The primary router, which looks like the previous Eero, connects to the modem (from your Internet Service Provider), while the two satellites, or Beacons, are placed strategically in the home to cast a wider mesh. Eero does at least tolerate less stringent compliance with deployment. For example, the previous model strongly suggested placing the three units within line of sight of each other to strengthen the connection. This is wholly unrealistic in many homes, what with walls, stairs and other obstructions cutting off any clear line. In this case, I set it up the same way I would set up any other mesh network, which is to separate the units by floor. If the modem and main unit are in the basement, then one satellite would go a floor above, with the other a floor above that. If I were in a larger space on one floor, then I would pick the two furthest points from the main unit and put the satellites halfway toward each of them. I should note, however, that the app does look for optimized locations, so if I had gone too far, it would tell me to move the Beacon and not progress further until I did. Eero uses one SSID, or network name and password, but it is still a dual-band router. It broadcasts both the 2.4GHz and 5GHz bands and allocates connected devices to the band it thinks needs the most bandwidth or throughput. All of it happens in the background, requiring no intervention from you as the network admin. By adding a third band, the units communicate together on a dedicated signal that functions independently of the others. Some might prefer the simplicity the Eero provides, but I suspect more demanding users will frown on the lack of customization. There is no way to use separate SSIDs, in case you want to manually choose which devices stick on each band. With only one Ethernet LAN port — and none of the Beacons themselves — you need an Ethernet port switch, like those made by Linksys and TP-Link, to add wired components. That matters if you use smart home products that need to connect to a central hub, like Philips Hue, Wink or Samsung SmartThings. It also applies if you use a network attached storage (NAS) drive to back up files or as a media server. Like other mesh Wi-Fi systems, Eero didn’t add a USB port to make that networkable for an external hard drive. You can set up a guest network for visitors to use, but have limited control over what devices have access and when on your own network. For example, there is no Quality of Service (QoS) functionality to help prioritize Internet traffic for demanding apps or devices (like online gaming, 4K streaming). You can do port forwarding, DHCP and UPnP, but the advanced features are quite thin for something at this price point. With the system laid out throughout the house, I tested for performance and throughput at various locations in and around the home. Since the system uses its own band steering to allocate devices to either band, I had no manual control over connecting devices to specific bands, as I have previously done with dual-band routers. In any case, this newer system does support MU-MIMO (multi-user, multi-input, multi-output), which allows it to communicate with supported devices to funnel bandwidth over simultaneously, rather than in a queue. The queue has long been the way routers work to distribute the Internet connection, and though it may be imperceptible to most, eliminating that does help speed up throughput. Not everything supports that feature yet, so my testing for it was somewhat limited. Still, throughput showed an overall improvement compared to the previous Eero. Data transfer speeds were solid at closer range. In the same room as the main unit, I hit 450Mbps, which was closer to what the original managed. The Beacons were considerably better, routinely hitting 170-180Mbps speeds in closer proximity — more than double what the previous Eero’s satellites did for me. Moreover, at 40 feet away, the Beacons only lost 40-50Mbps in speed, still besting the previous version. In other words, it was easy to stream in HD or 4K or play games online throughout a home of more than 2,000 sq. ft. At no point did I find the signal to degrade to a buffering mess. Even outside on the balcony or backyard, connectivity was steady and consistent, if a little faded the greater the distance. 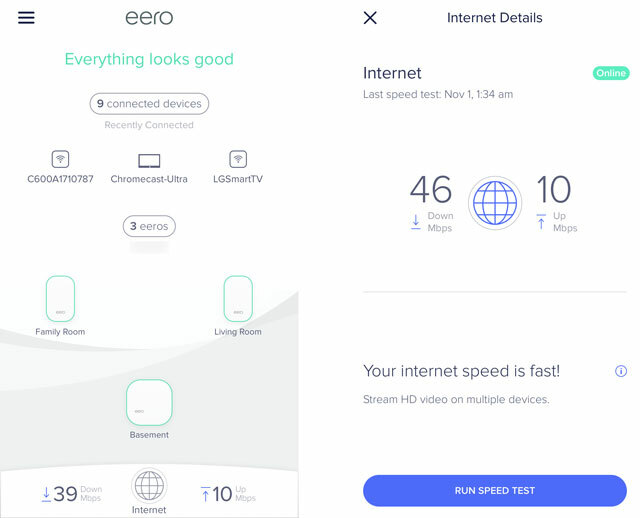 Despite the improvement, the new Eero won’t lay any claims to being the fastest. The Linksys Velop and Netgear Orbi beat it at every distance. The Velop also offers more features to customize performance and prioritize devices or applications. The Orbi also offers more, though its parental controls could be less convoluted. Compared to others, however, it is a mixed result. It does better than the TP-Link Deco M5 and Asus Lyra at closer proximity, but not necessarily further away. It was more robust and consistent than the Google Wifi, which offers barebones features to boot. I never really encountered any drops or buffering issues with the Eero, and this is with at least a dozen devices connected at once. Except I wished there was more I could do with it. Manual band steering is something I like to have because I can keep low-latency devices and faraway devices on the 2.4GHz band and delegate the bandwidth-thirsty devices to the 5GHz band. Ethernet ports on the Beacons would’ve been great too, if only for the potential of keeping one right by a home theater. I could connect a switch there and have all those components plugged in. 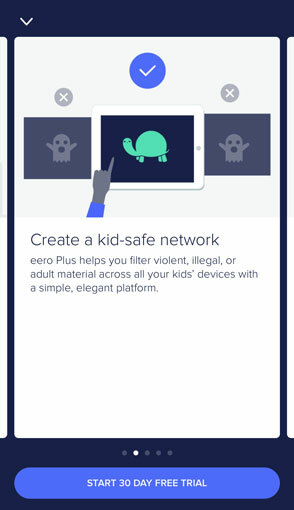 You can choose from two tiers of parental controls. The free one allows you to create profiles for family members to then pause access to their devices or schedule when they would be offline. One limitation I noticed was that a device could only be added to one profile at a time. If there were a shared computer or tablet, for instance, it would have to be paused for everyone, not just the offending party. The second tier is called Eero Plus, and it’s a subscription-based service that takes security further. To block access to certain sites and filter out inappropriate content, you would have to pay $9.99 per month or $99 per year for the service. Eero tries to sweeten the pot by adding malware, phishing and anti-virus protection for the home network into the service. Plus, it includes priority tech support with limited or no waiting time. That’s in contrast to competitors, like TP-Link’s Deco M5 and Asus’ Lyra that offer network security features free out of the box. If you’re on the fence, Eero offers a 30-day free trial to test all of it out before committing to anything. Like the original Eero, the next-gen Eero Wi-Fi mesh system also works with Amazon’s Alexa voice assistant. Alexa isn’t built-in, but it is a pretty seamless integration, making it possible to link your account and create a "Skill" set. From there, you can control access to certain devices or family profiles through voice command. For example, if I said, ‘Alexa, tell Eero it’s time for homework,’ or ‘Alexa, tell Eero it’s dinnertime,’ it would know what to cut off based on the scheduled parameters I had set. To date, Google Home doesn’t support Eero and Apple’s support through HomeKit is indirect. I wasn’t able to get Siri to control the mesh in any way, but I could control HomeKit-compatible products, like Philips Hue, for instance, which was using the Eero for Wi-Fi access. Eero’s Gen 2 Wi-Fi mesh system provides an elegant setup with consistent performance that requires little upkeep. Eero isn’t alone in offering that, but it is one of the most aesthetically attractive of the mesh systems out there. Others offer better performance with the same or more range, like a two-pack of the Linksys Velop or Netgear Orbi, but the Eero is easier to use. The Eero also comes with some compromises, mostly in features that less demanding users won’t care about – to a point. The company is asking for a subscription to deeper parental controls and network security when other competitors don’t ask for a penny. This is a system that starts at $249 for a two-pack, going all the way up to $466 for the three-pack of main units. There is a lot of convenience and simplicity that comes with those price tags, and that’s the value proposition – an attractive Wi-Fi whole home network that works with little technical know-how.